What Is Zone Controlled Heating? A zone control system is a system designed to give you better control over the HVAC system in your home. Zone control allows you to heat one space of your home while another space remains at a standstill. Zone control works through a process of installing dampers throughout the ducts in your home. These dampers effectively “zone” your home. 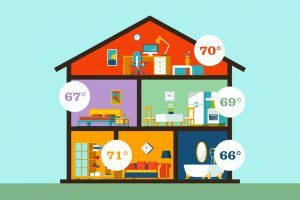 Each zone in your home has its own thermostat installed in it to control dampers nearby, but there’s also a master thermostat in place in case you want to heat your entire home at once. The benefit of zone control is that you can control how much heating or cooling each part of your home gets. It Helps You Save Money: If you live in a large home or a two-story home it can be really hard to adequately heat your entire space. Zone controlled heating allows you to heat the space that you need rather than the space you want. It’s Easier on Your Heating System: Forcing your heater to warm your entire home puts a real strain on your heating system. Forcing your heater to work overtime like this raises your heating bill and shortens the expected lifespan of your heating system. Zone control eliminates both of these problems. It Boosts Your Home Comfort: Sometimes, you don’t even want to run your heater because you know how expensive it’s going to be. You can avoid this problem with a zone-controlled heating system because the fine-tuned control allows you to run your heater effectively. If you’re ready to experience a superior level of heating and cooling in your home, make sure that you contact our team at Fulmer Heating and Cooling.